Business customers in the western part of Massachusetts who receive their electric bill from Eversource Energy have started to feel the effects of a large rate increase that took effect at the beginning of the year. On January 1, 2019 Eversource Energy enacted a rate increase on their small business default rate. The default rate increased from $0.10859 per KWh to $0.12355, which represents a 13.78% increase. Since the rate did not go into effect until the first day of 2019, many business customers did not learn about the change until they received their electric bill in February. The majority of Western Massachusetts electricity customers receive their power from Western Eversource Energy, formerly named WMECO. As an electricity choice state Massachusetts customers have the option to shop for electricity rates from competitive energy suppliers who are licensed by the Massachusetts Department of Public Utilities. The choice laws give consumers the option to shop for competitive rates. If a customer does not choose a competitive price plan they are put on a default supply price with their local utility such as Eversource Energy. When an environment exists that allows competitive suppliers to offer electricity rates below the default price it produces an obvious incentive for the customer to switch onto a competitive supplier’s plan. Such an environment currently exists for small business customers (rate classes 23, 24, G-0, T-0) in the Western Massachusetts service area of Eversource Energy. Small business owners will have to battle the new default rate through the end of June 30, 2019, which they can do by searching for a competitive fixed electricity rate plan. Currently the new default rate that will go into effect in July of 2019 and stay stagnant through the rest of the year is unknown. However, there is no guarantee that it will go down from the current $0.12355 price. The volatility of the default rate throughout the last few years combined with the current high price provides business decision makers with an incentive to lock in a long term fixed contract of at least 24 months. In addition to lowering the electric bill and guaranteeing savings over the next few months, the business will be hedging its risk at potential further increases. In a time of economic uncertainty the last thing business owners wants is an unexpected 13.78% increase on a necessary expense. The problem is easily solved by taking a little bit of time to search, compare, and shop for low Massachusetts electricity rates. Competition in electricity rates is alive and well throughout Connecticut as we head into 2019. 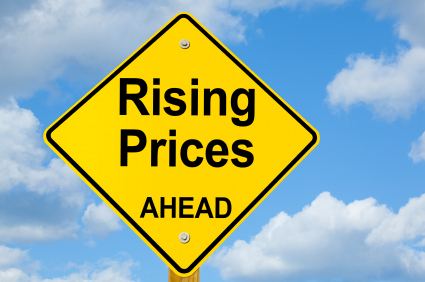 Both major utilities in the state, Eversource Energy and United Illuminating, have announced large price increases in their default standard service rates that will likely result in an increase in shopping activity amongst all customer rate classes. After a rough 2018 which saw little market growth for the majority of companies, competitive Connecticut electricity suppliers are finally able to offer worthwhile savings to customers on their utility default service. Eversource Energy, formerly Connecticut Light & Power (CL&P), announced rate increases for commercial and residential customers on their standard service rates to go in effect at the beginning of the new year. On January 1, 2019 residential customers in Connecticut who receive an Eversource electric bill will see their electricity generation rate increase by 18.9% which equates to $18.90 more for power for a customer who uses 1,000 KWh a month. The best thing a customer on the standard service rate can do is to start shopping for a competitive Eversource rate offered by a licensed Connecticut supplier. Several competitive electricity suppliers are offering rates that are lower than the default standard service rate which will result in electric bill savings for customers who take action and choose a competitive rate plan. The new standard service rate is increasing to $0.10143, which will be the first time the rate has surpassed ten cents since the January to June period of 2015. Eversource Energy updates the rate on January 1 and July 1 of each year. Eversource Energy in Connecticut has been able to keep the rate relatively low over the last couple of years which has slowed electricity shopping growth in the state as the incentive for new customers to shop was limited. Now that the default rate is in an upward trajectory, shopping activity is expected to increase. Historic Connecticut standard service rates reveals that the price usually goes up in the January period and down in July. However there is no guarantee that the price will go down on July 1, 2019 as this is not always the case. In fact, in 2017 the default rate actually increased in July from the January period. The unpredictability of what direction the standard service rate will go is another reason for customers to shop the competitive Connecticut electricity market for long term fixed electricity prices. Below are current rates offered by licensed Connecticut electricity suppliers. On November 1, 2018 the basic service rate offered by National Grid to Massachusetts residential customers increased by a baffling 26.2%. Basic service is a default rate that National Grid charges to those customers for electricity generation supply who have not elected to purchase their power from a competitive electricity supplier. Residential customers can save money against the higher default rate by comparing competitive rates offered by suppliers who are licensed by the state of Massachusetts. Those customers who are already on a competitive rate plan will not be effected by the November 1 rate increase. Numerous competitive rate plans are available for National Grid customers to choose between. In response to the 26.2% price increase competitive Massachusetts suppliers are pushing back and stepping up their marketing efforts in order to gain new customers. Energy price comparison sites such as ElectricRate.com are posting competitive rate offers as much as 12.6% less than the basic service rate offered by National Grid. Other rate green energy options are available that provide small savings. As of May 2018, the Massachusetts state government reported that roughly 42.8% of the 1,035,462 residential customers that National Grid delivers power to had elected to purchase their electricity from a competitive supplier. The remaining 592,000 customers have the ability to substantially lower their National Grid electric bill by comparing and selecting a lower rate plan. The new basic service rate of $0.13718, up from $0.1087 in October, is the highest the default rate has been in over three years. Massachusetts electricity suppliers are expecting a large new batch of first time shoppers in response to the high rate, which will stay in effect until the end of April of next year. Competitive rates offering savings versus the basic service rate are shown below. All competitive rates are provided by suppliers who have been licensed by the state of Massachusetts.